JEWELS ON QUEEN is a pop up shop opening on Wednesday 28 November at Number 40 Queen St Woollahra, to showcase Anne and Nell Schofield ‘s collection of exotic Indian traditional and tribal Jewellery and a brilliant private collection of Central Asian Turkmen jewels. Both traditions of jewellery have deep symbolic meanings and use images and forms denoting fertility, long life and prosperity. Indian jewels sometimes incorporate images of local deities such as the sun god or the goddess of the harvest. The Indian silver tribal jewels include necklaces, chains, earrings, pendants, bangles and rings and are extremely wearable and affordable. Turkmen jewels were made of silver and decorated with semi-precious stones, and sometimes gilded to enhance colour and value. Cornelian was worn to ward off death and disease and turquoise was a symbol of purity. 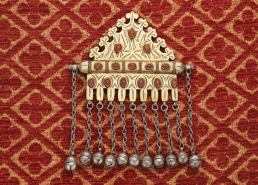 Featured is an exotic Turkmen bridal headdress set with cornelian and some bridal ornaments with amulet sections in which to keep charms for spiritual protection and to ward off evil and ill health.